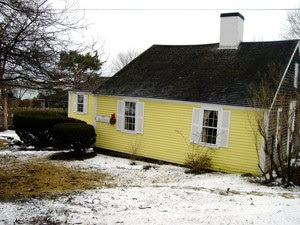 Close to the centre of Scituate, you find this old yellow colonial style house. It used to be the home of the socalled American (sometimes Lighthouse) Army of Two, Rebecca and Abigail Bates, daughters of Scituate lighthouse keeper Simeon Bates. These sisters did, in september 1814, by playing their fife and drum, alarm an advancing boat of british officer enough, to avoid an attack on Scituate. They lived in this house, and died both at an old age.